From there, like any other fan, I spent many a day and night with what seemed to be an old friend back again to tell a familiar tale woven throughout the magnificent music of the E Street band. Early on Bruce became a favorite subject to draw. What fascinated me was his undying energy on stage and passion for connecting with his audience through his music. I tried to capture that in my art. My goal is to one day design an album cover for one of Bruce’s upcoming albums. The first Springsteen for President poster was created in 2004 for the Springsteen Tour, which also happened to be the ’04 Bush election year. The poster was then re-created for this year’s tour schedule and 2012 election. So one could gather I’m kind of a “middle of the roader” when it comes to politics. But no matter what party you support, I think we all agree…Bruce makes the BEST CANDIDATE of all! 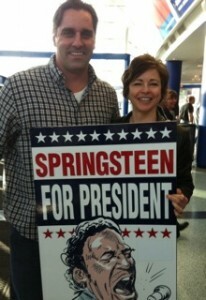 While walking around the Palace of Auburn Hills in Michigan, my Aunt Tina and I saw dozens of fans who wanted their picture taken with the Springsteen for President poster. They all asked where they could buy the signs or shirts. Hit with the overwhelming fact that my art could create such attention and benefit something positive, I reserved this domain that you’re clicking through right now. Yes, the roots of this movement began to take shape while I was waiting in line for some beverages and dough balls. Thanks to Julie and Sharon from Michigan for brainstorming this idea with me. You asked for it…so here it is. Please share this domain with friends who would appreciate it! Special thanks to Tina for helping get the word out. She’s a long-long-time Bruce fan and the best promoter of my art in the world.